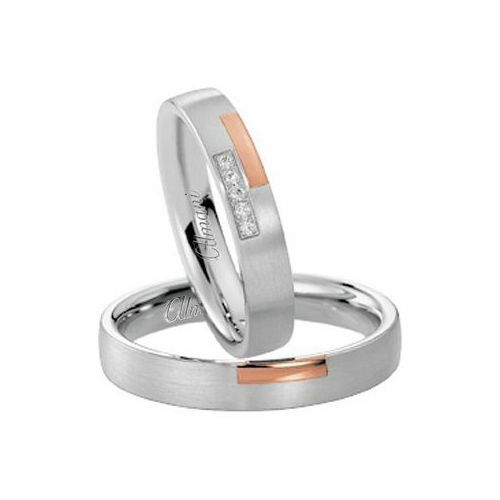 This beautiful set features a flat design in 14k white gold with a small rose gold design on the bands. HER band features five round brilliant diamonds placed in a pave setting on the opposite side of the rose gold design. This design in two-tone truly highlights the different gold colors and allows for contrast between the two beautiful finishes. 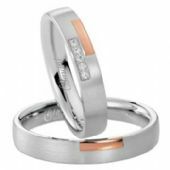 The wedding bands are carefully crafted in 14k rose and white gold. The two-tone gold coloring allows for a more contemporary appeal.